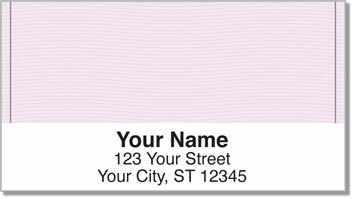 Give your outgoing mail color and harmony when you choose return address labels that match your traditional personal checks. The Safety Check design is always a best-seller. Now you can stick the same no-nonsense style on every envelope. It's a great choice for perfectionists and neat-freaks who love organization and order. But the biggest benefit is how much easier your new labels make the often time-consuming task of preparing to send letters and packages. Since they're self-adhesive, all you have to do is peel and place. Order your very own Purple Safety Address Labels from CheckAdvantage today! You'll also find five different shades of matching checks and labels in this design.